The Original Pancake House | Eat It, Damn It! I needed to get my car battery checked on a Saturday. Taking in a vehicle on a Saturday afternoon is just a recipe for annoyance and impatience. It should not take long to check a battery, but of course, there is the “We’re swamped,” “I’ve only got 2 technicians,” “You didn’t make an appointment,” statements, that one understands, but doesn’t make the time go any quicker. I needed brunch. I found The Original Pancake House in White Plains. It is a miniature chain in New York. The feel is decidedly casual, close to the vibe of their main competitor, IHOP. The space is pretty roomy, which is nice, and the high ceilings dissipate some of the chattering of nearby tables. The menu is huge. I needed a few minutes to absorb it all. There are a plethora of pancakes, omlettes, sandwiches, specials, sides… It was a little overwhelming. However, due to my leg work beforehand, I was leaning towards omlette. 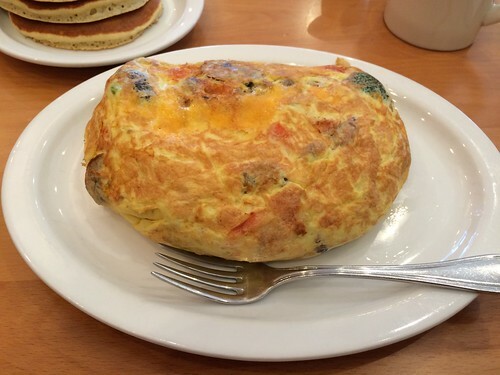 The Vegetarian Omlette is gigantic. The fork in the picture is to give you a sense of scale. If you’ve ever held a foam football made for toddlers, you’ve got a good idea of the size of this eggy monster. 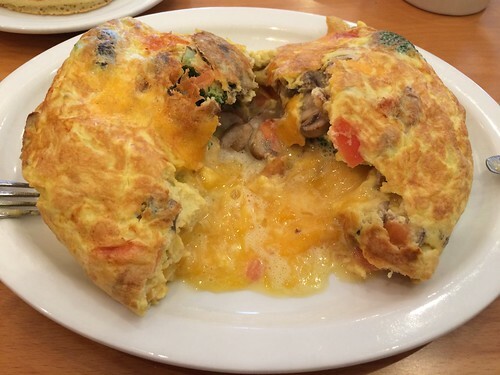 It came complete with broccoli, mushrooms, tomatoes, and cheddar cheese. Nothing was skimped on. This was a big, fluffy, overstuffed, behemoth of an omlette. Check out the innards. It was very good. The eggs were not overcooked. The broccoli was not raw, which I love. The mushrooms were big and meaty. The cheddar was sharp and plentiful. I wholeheartedly recommend getting an omlette with your choice of innards. Omlettes were available with sausage, pulled pork, chorizo, peppers, and a ton of other stuff. Though the menu warns that dishes may take 20-30 minutes during peak operating hours, it is well worth the time. I had an option of toast or pancakes. Wanting to try out the item this establishment uses in their namesake, I went with pancakes. The pancakes are well cooked, but boring. First strange thing, the pancakes weren’t hot. I put some whipped butter on top, and it didn’t melt. 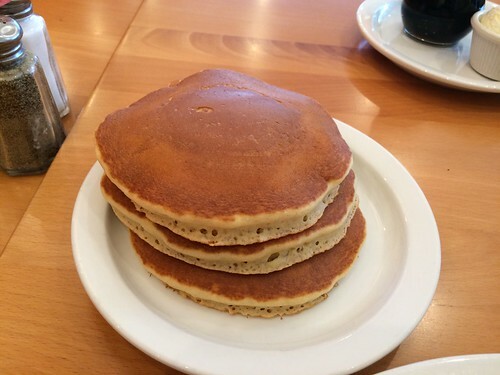 Second, the syrup they use is really thin, practically watery. The pancake texture is good, but the flavor is just “blah”. I imagine that their pancakes might be good with a robust topping, but plain… not so much. This is not to say that I would try their pancakes again, but I’d probably get some sort of fruit and/or nut topping. I will probably be returning to The Original Pancake House at some point in the future. I’m curious about their take on sandwiches. I will not be having plain pancakes again.